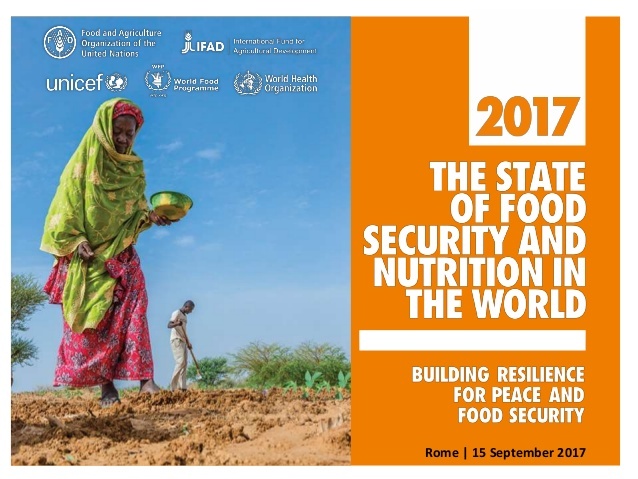 On September 17, “The State of Food and Security Nutrition in the World 2017” report, known as SOFI for its acronym in English, was presented in Rome. For the first time, the report has been coordinated by the three Rome-based agencies, FAO, IFAD and WFP, in collaboration with WHO and UNICEF. The report is the first UN global assessment on food security and nutrition to be released following the adoption of the 2030 Agenda for Sustainable Development, which aims to end hunger and all forms of malnutrition by 2030 as a top international policy priority. Specifically, the report monitors progress towards both the targets of ending hunger (SDG Target 2.1) and all forms of malnutrition (SDG Target 2.2). SOFI 2017 – Building resilience for Peace and Food Security, focuses on the strong nexus between conflicts and food security: about 60 per cent of the 815 million people suffering from hunger live in countries affected by conflicts. The results of the report are clear: world hunger is on the rise: the estimated number of undernourished people increased from 777 million in 2015 to 815 million in 2016. According to the numbers of SOFI2017, the food security situation visibly worsened in parts of sub-Saharan Africa, South Eastern and Western Asia. This was most notable in situations of conflict, in particular where the food security impacts of conflict were compounded by droughts of floods, linked in part to El Niño phenomenon and climate-related shocks. From now on, SOFI will monitor not only the progress made towards ending hunger, but also the progress made in eliminating all forms of malnutrition not only in developing countries, but also in developed ones. Stunted children. The rising trend in undernourishment has not yet been reflected in rates of child stunting, which continue to fall. Nonetheless, the world is still home to 155 million stunted children. Levels of child stunting are still unacceptably high in some regions, and if current trends continue, the SDG target on reducing child stunting by 2030 will not be reached. Some 155 million children aged under five are stunted, the report says, while 52 million suffer from wasting, meaning their weight is too low for their height. An estimated 41 million children are now overweight. According to the data included in the new report: “the prevalence of stunting is currently highest in Eastern Africa, Middle Africa, Western Africa, Southern Asia and Oceania (excluding Australia and New Zealand), where more than 30 percent of children under five are too short for their age”. Among the key determinant factors of these numbers of stunted children around the World, the authors of SOFI2017 referred to: (I) compromised maternal health and nutrition before and during pregnancy and lactation; (II) inadequate breastfeeding, poor feeding practices for infants and young children; and (III) unhealthy environments for children, including poor hygiene and sanitation. 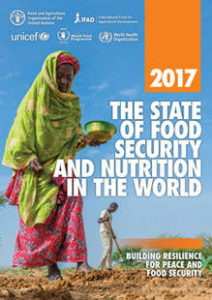 However “The State of Food and Security Nutrition in the World 2017″ report not only presents numbers but also proposes different ways to address stunting affecting children: “stunting can be addressed through preventive actions, including by ensuring that pregnant and lactating mothers are adequately nourished, that infants receive exclusive breastfeeding during the first six months of life, and that complementary foods are available in adequate quantities, quality, and variety for children aged 6–23 months. To reduce stunting, it is essential to focus nutrition interventions on the first 1.000 days of life and improve access to quality health services for maternal and child health. Other steps may be needed to prevent infections and illnesses improving access to safe water, awareness of safe disposal of child faeces, and basic hygiene”.